Usually several stems ascending from an oblique, branched rootstock, 3 to 6 inches long at flowering time. Leaf blades orbicular, heart-shaped, crenate-serrate on the margins, blunt, one-half to 2 inches wide, the upper ones smaller and more pointed. Flowers numerous, usually pale violet or rarely white, raised above the leaves on axillary stalks, 2 to 3 inches long. Common in low ground or moist, shaded woods, Quebec to Minnesota, south to Georgia. Flowering from early spring until late in May. Closely related, but more dwarfed, with small, orbicular blades and deep violet flowers is the Alpine Dog Violet (Viola 1 abradorica Schrank) occurring in New York only on the higher mountains of the Adirondacks. 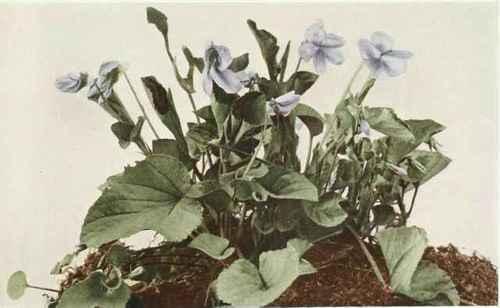 The Sand Violet (Violaadunca J. E. Smith; V. subvestita Greene) is finely puberulent, the stems only 2 to 6 inches long; leaf blades ovate, one-half to 1 inch long, crenulate, blunt, subcordate; flowers deep violet, with a straight, blunt spur about 3 lines long. Rather local in sandy or sterile soil or on dry stony ridges, Quebec to Maine and westward.